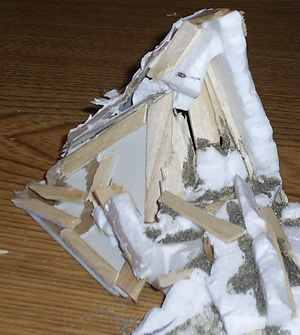 Here’s some tips to making a realistic looking pile of rubble! To me, this is a pretty ugly pile. I found that the reason is because the pieces of wood are on top of the gravel as opposed to in the pile. So I started making sure that my pile of rubble was very realistic. I’ve done about 4 hours of detailing work on my pile of rubble to make it look as real as possible. 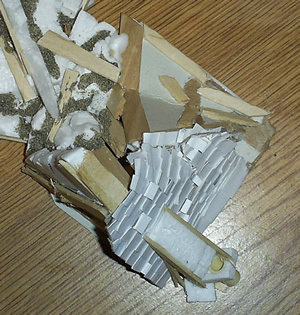 I’ve been filling in any deep crevices with glue and pieces of wood and foam. I filled the holes with glue and then covered it all with sand. After it dried, I shook off all the excess sand. 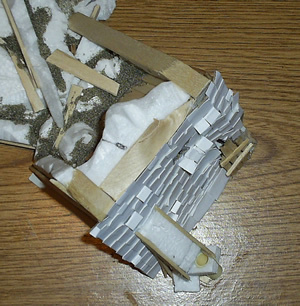 I also added a destroyed window frame to the rubble, You can see it still attached to a piece of wall in the rubble. Here is a close up of the collapsed tower roof. Here is a close up of the pile of rubble at the base of the building. That obviously is not a roof that fell four stories, so I decided to fix that. 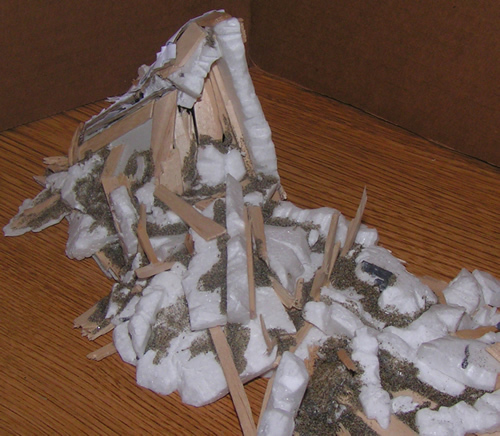 Here is the process I took to destroy my perfectly good Mordheim Roof. Now I just have to do a little bit of detailing to make it fit in perfectly. I hope you have a Happy New Year this 2008! The building that I am currently working on for my Mordheim Terrain is a four story tower that has fallen over into a pile of rubble. This creates quite a long terrain piece that I am building without a base. The weakest part of my terrain is on the left side of the Popsicle brace. Where the rubble meets the first floor of the building. Second, I’ve added fallen debris that acts as support beams. There are three sticks that look like they have just fallen over in the debris, but are actually embedded deep within the main building and glued securely to the rubble. 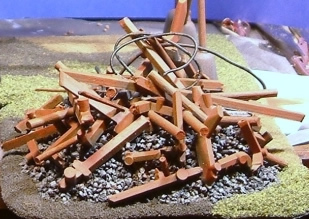 Lastly, I am going to create a couple piles of rubble right next to the main floor which will also add support to the weak point on my piece of terrain. Over the last week, I’ve been trying to create a system to create small Mordheim roof tiles that look good. 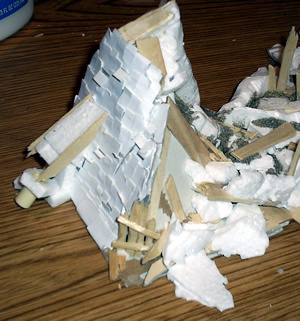 Most scratch-built Mordheim buildings these days have 1/2″ to 1″ wide roof tiles which translates to 2.5 – 5 feet wide. Which, by the way, is completely ridiculous. After lots of fiddling with different types of material for my roof tiles, I tore off my old Mordheim Roof and created a new one from card stock. Cut a strip of card stock 1.1 cm wide. Cut slits along one side to create the different tiles. Then I cut off the ends of most of the tiles to give each tile a different length. Then for to show wear, I bent the tiles and chipped the corners of every other tile. Note the two holes I added to create the leaky roof. I think this came out looking very well. I only have one row of tiles along the peak of the roof to add, and This section of roof should be done. The only short-coming with using card stock is that it will soak up the paint and become wet. Hopefully it won’t “melt” together and loose it’s shape. My latest work has been on my Competition Entry for TerraGenesis.com. I have a couple of minor details to work out before completing the construction phase of my project and moving on to the painting phase. One of the biggest problems I’ve faced is getting the roofing tiles to work. In almost all pictures of Mordheim roofs that I have seen, the roofing tiles are about 1/2″ wide. Which translates into almost 2 1/2 feet wide in Mordheim size. There is no way that most buildings (even in fantasy) would have roof tiles 2.5 feet wide! So began my quest for smaller roofing tiles. I got a deck of mini playing cards for Christmas and cut those up into rows of roof tiles. This is where I ran into my problem: The playing cards were so laminated, paint wouldn’t stick to them. I tried everything I could think of, and asked for help at the TerraGenesis forum. Unfortunately nothing could solve my problem until I realized I could find a similar material that wasn’t laminated: Card Stock. I even had a couple sheets in my laptop bag! I cut up one row of roofing and glued it down tonight. I’ll be adding and update about it tomorrow. I’ve been working hard on my Collapsed Tower for Mordheim, and today we had a visit from the Mordheim Carpenter. 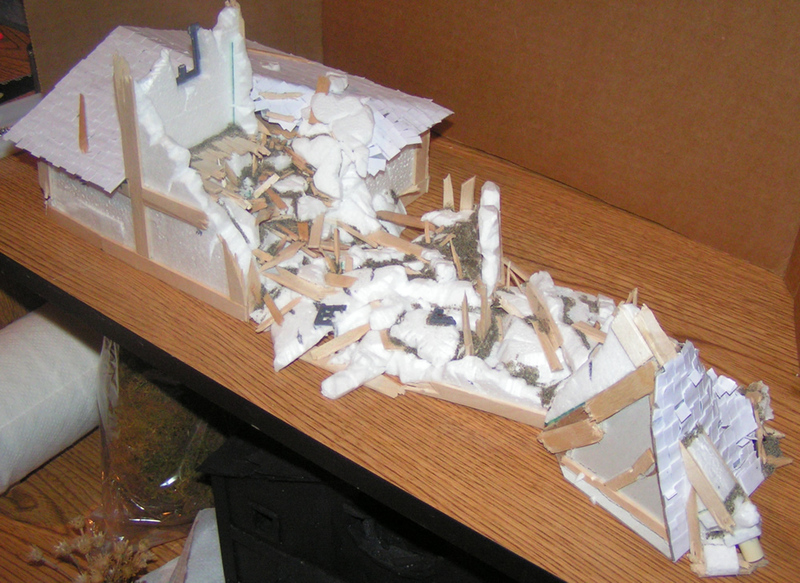 This collapsed tower almost completely destroyed one side of the main floor, but the other side of the main floor is still in perfect condition. Today, I had the Mordheim Carpenter out to add wooden framing to the entire house. I added a wooden door and door frame. I’ve touched on my thoughts on Adding a Base to Terrain and my last two buildings have not had bases. As I mentioned probably the biggest Con of not having a base is the difficulty of keeping the entire building supported. This is especially true for my entry into the TerraGenesis Fallen Over Competition. As you can see, I’m going to have to create a lot of supports between the roof of the tower, the rubble and the main building. 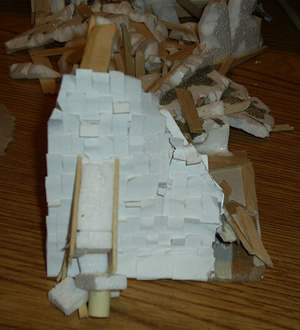 All I had connecting the two was a thin sheet of Styrofoam, so this is what I came up with: Adding support beams under the foam. 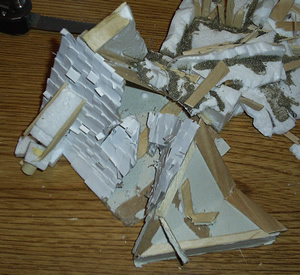 1) I cut out slits under the connecting piece of foam. I cut out enough space for two sticks to be sticking halfway out, and for two sticks to run parallel for extra support. (I did this we a fully extended (flexible) razor blade. The flexible aspect allows me to rub the blade horizontally across the bottom of the foam creating a perfect hole. See picture. 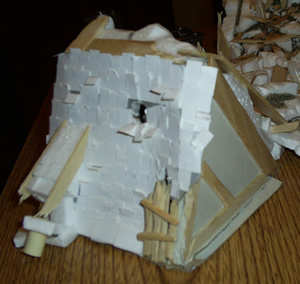 2) I cut out small slits in the bottom of the roof and the bottom of the main building; just big enough to slip in the Popsicle sticks. 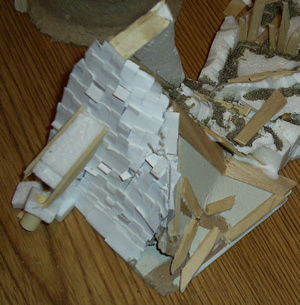 3) I glued in all of these supports with Elmer Glue. 4) I am also planning on adding some supports to the top of it, in the form of fallen debris between the separate sections. They will look like they are just leaning on the main building (or roof), but they will actually act as additional support. You can see a good example of this in the first picture above. Good thing foam is not too heavy. I think these supports will be enough to hold this terrain together. Another site that I’ve been lurking on for a while is TerraGenesis. Great site full of endless resources. I first found this site when I was looking for board creation ideas. I found this page with a great Mordheim Table Idea. I then found that they hosted a new two month, terrain competition every month (so there is always two competitions available). 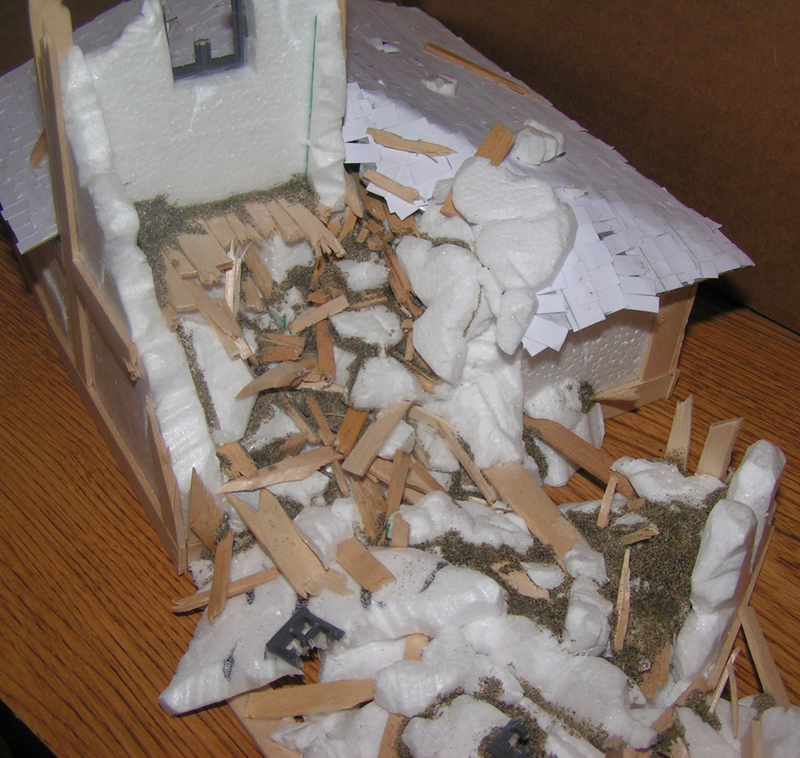 They came up with a perfect competition for a Mordheim building called the “Fallen Over Competition.” I started a for a Mordheim tower that fell over. I will be posting some of my thoughts and progress on it here as well.